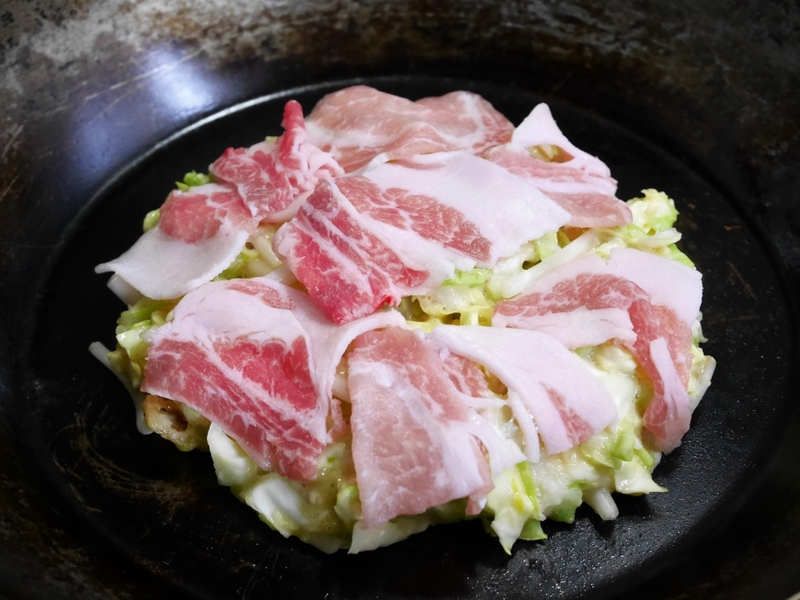 It’s a kind of Japanese grilled dishes cooked on a hot plate. 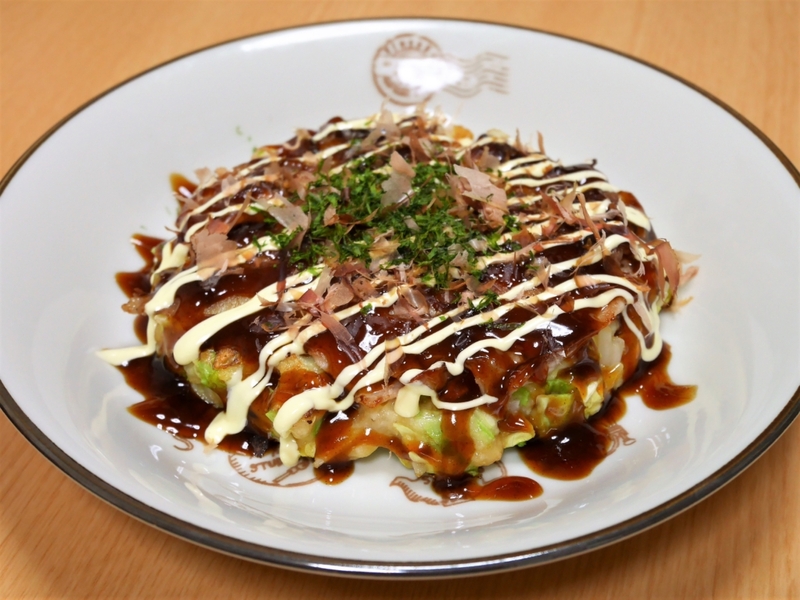 Freshly cooked Okonomi-yaki with juicy sweet sauce and mayonnaise makes you smile. It’s perfect for your home party. Let’s enjoy cooking with your family and friends! 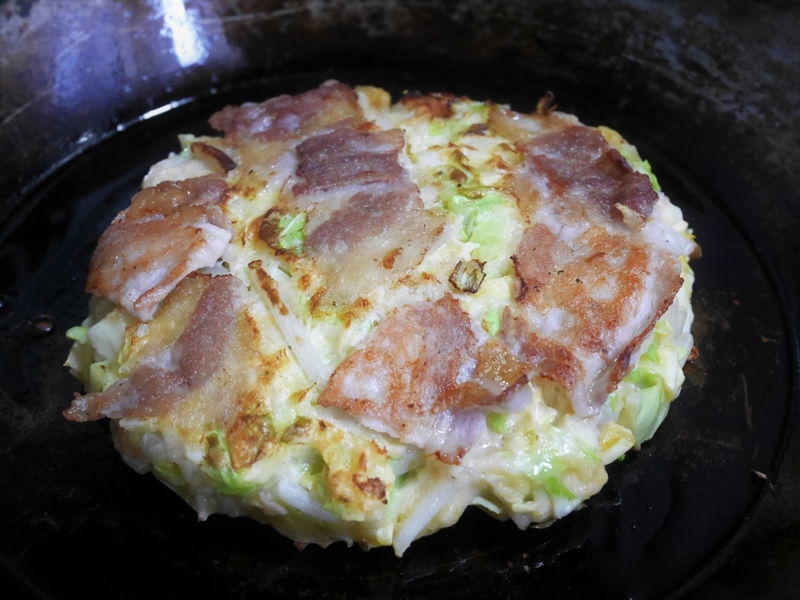 Okonomi-yaki is mainly made of cabbage, egg and flower. 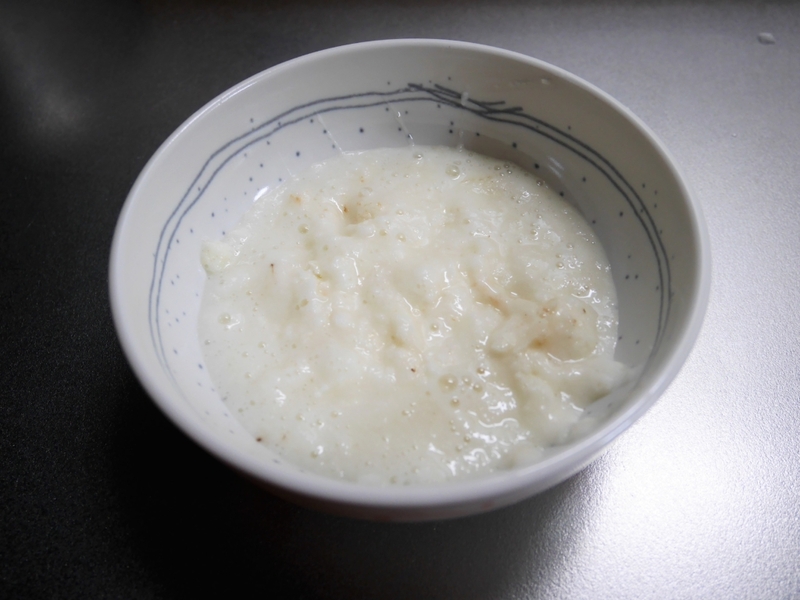 The ingredients and recipes are varied depending on the region or the home. 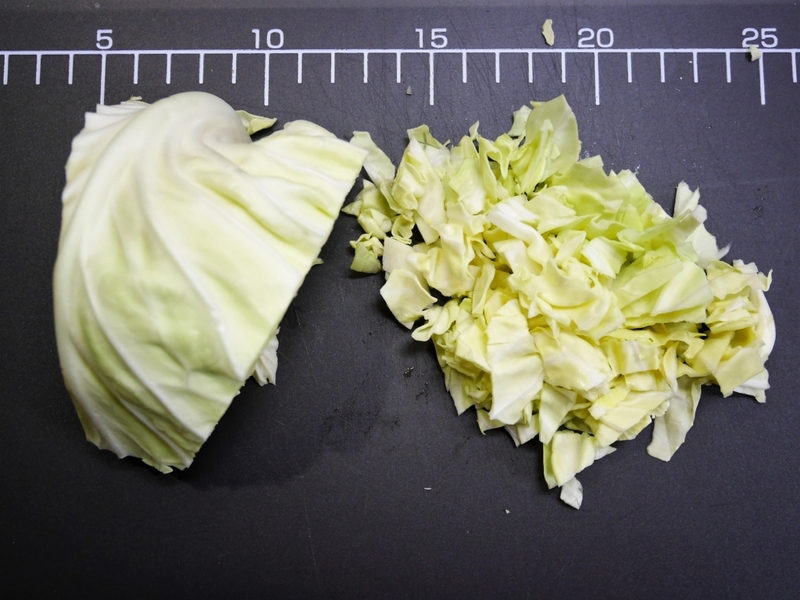 Since “Okonomi” means “what you like” and “yaki” means “grill”, you don’t have to prepare any special ingredients except the basic ones. 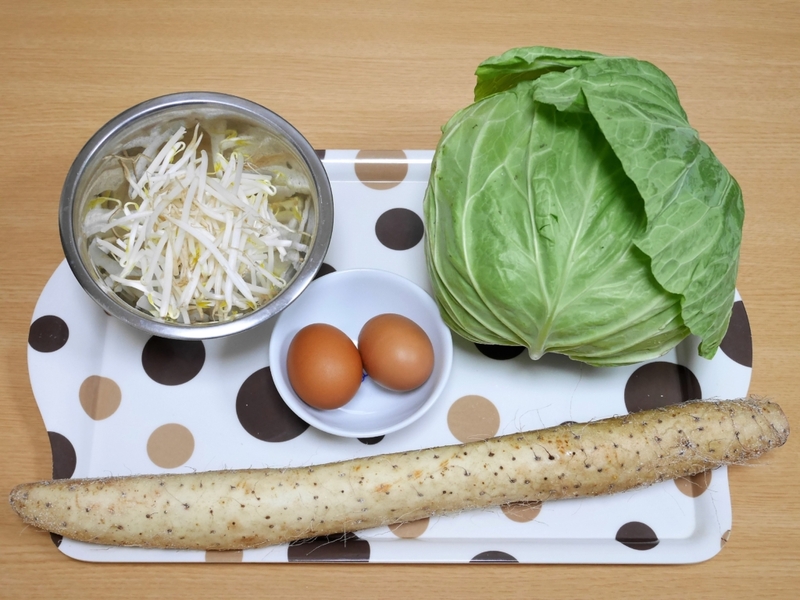 You can try various things what you like in the fridge! 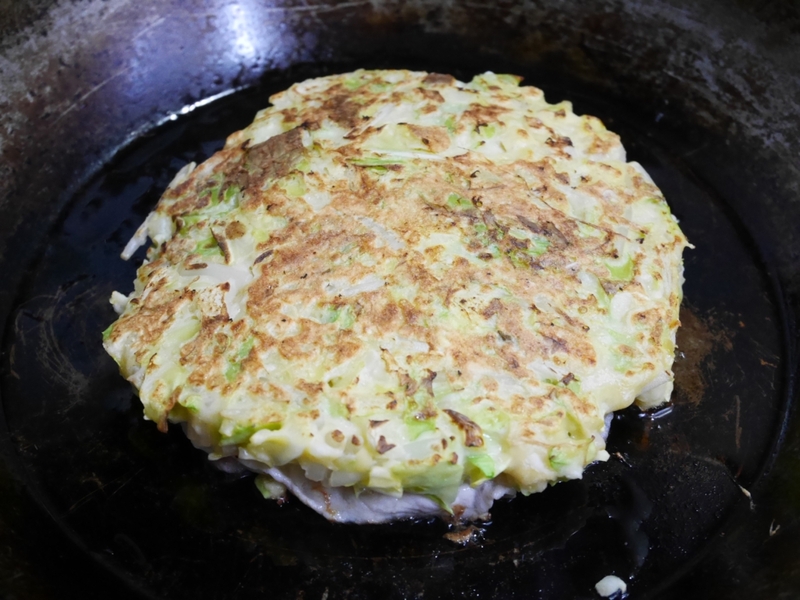 There are roughly 2 styles of recipes called “Kansai-fu (Kansai style)” and “Hiroshima-fu (Hiroshima style).” This is a recipe of “Kansai-fu” Okonomi-yaki which I often cook at home. 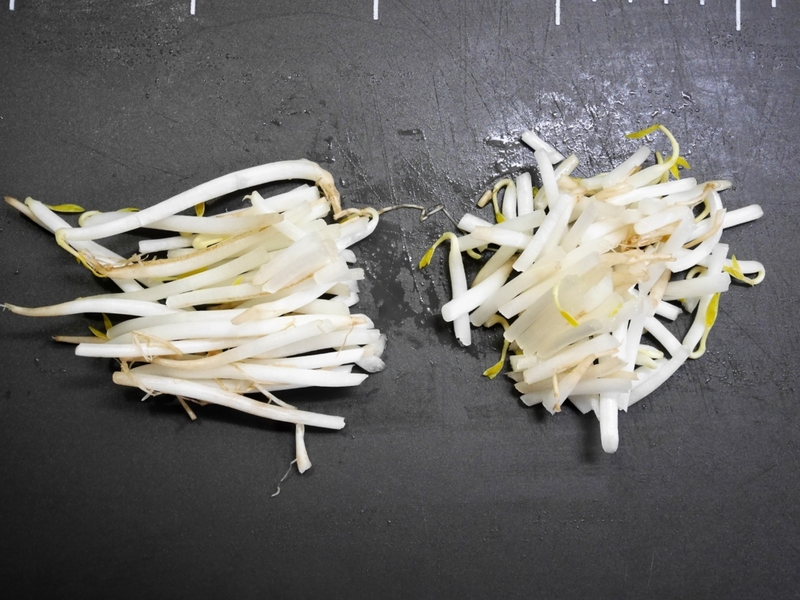 Cut the bean sprouts to the half size. 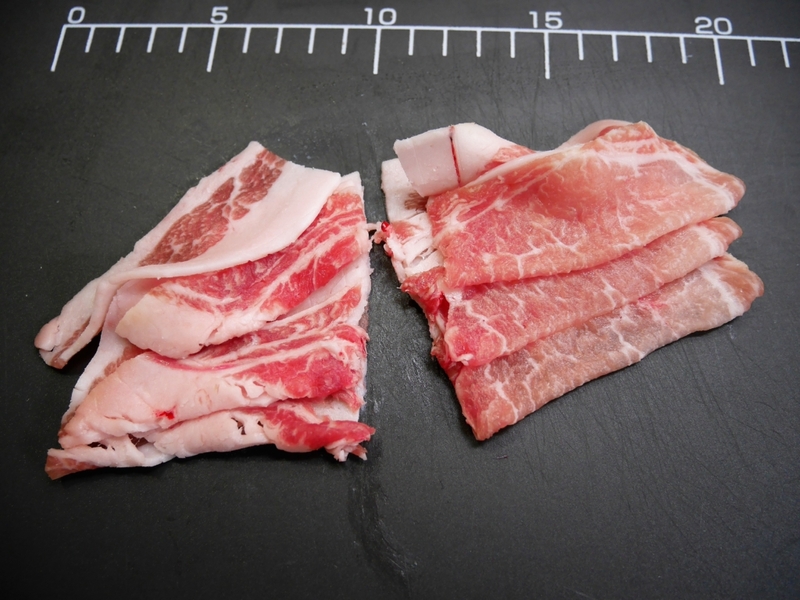 Cut the sliced pork back ribs into 2 or 3 pieces each. 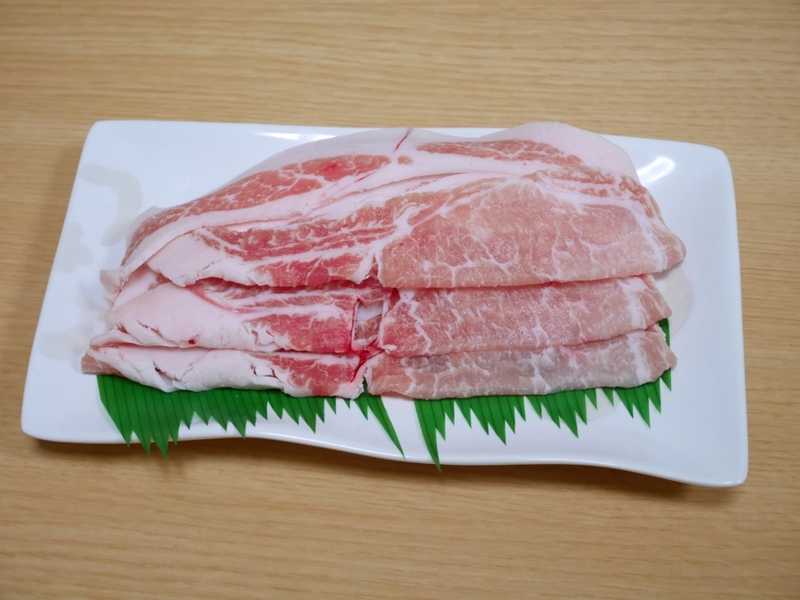 Cut the sliced pork into 2 or 3 pieces each. Peel the skin of a yam and grate it. 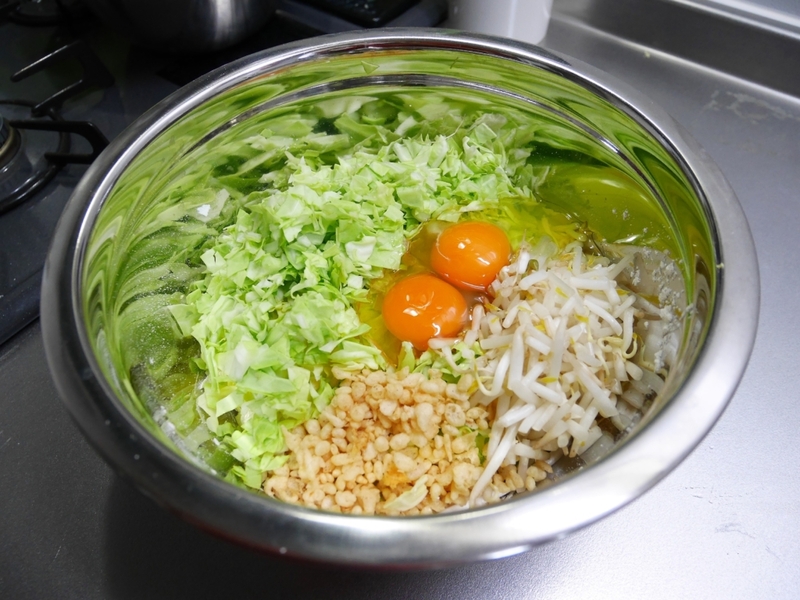 Put the grated yam, flour and instant broth granules into a bowl and mix them well. 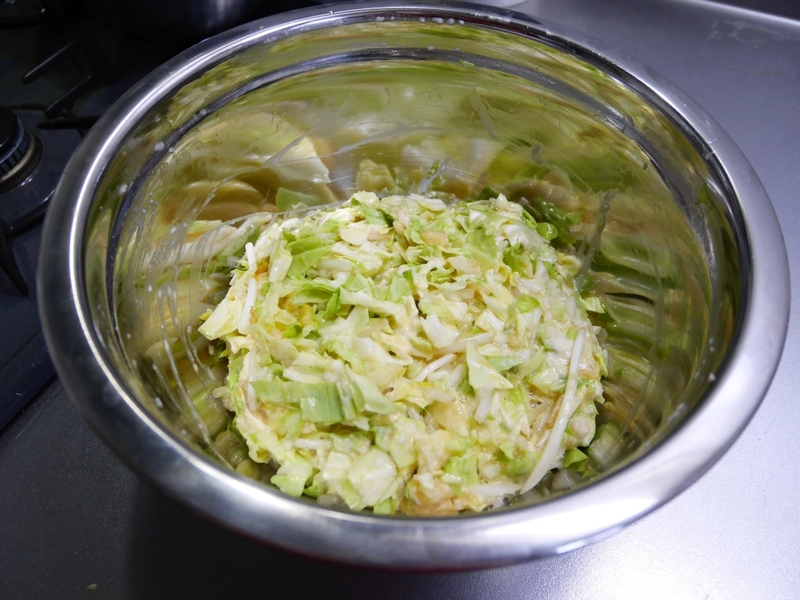 Put the cabbage, bean sprouts, eggs and ten-kasu into the bowl (Step2) and mix them lightly with a spoon. 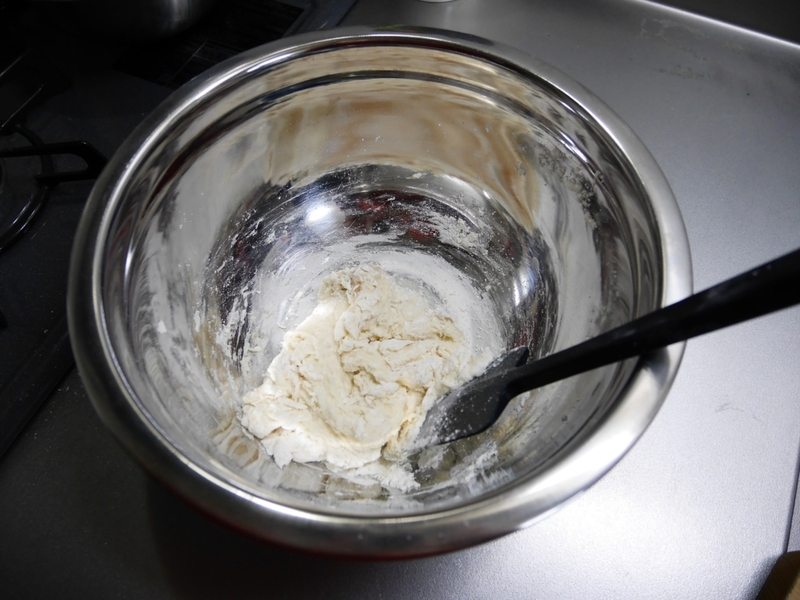 Put the ingredients in the bowl. Put some oil in a frypan or a hot griddle and heat it up to about 220℃. Grill it on medium heat. Then put the sliced pork on the surface. When it gets a little charcoal, flip it and heat thoroughly on low heat. And when the sliced pork turns crispy, flip it again. Grill both side on medium heat until it gets golden brown. 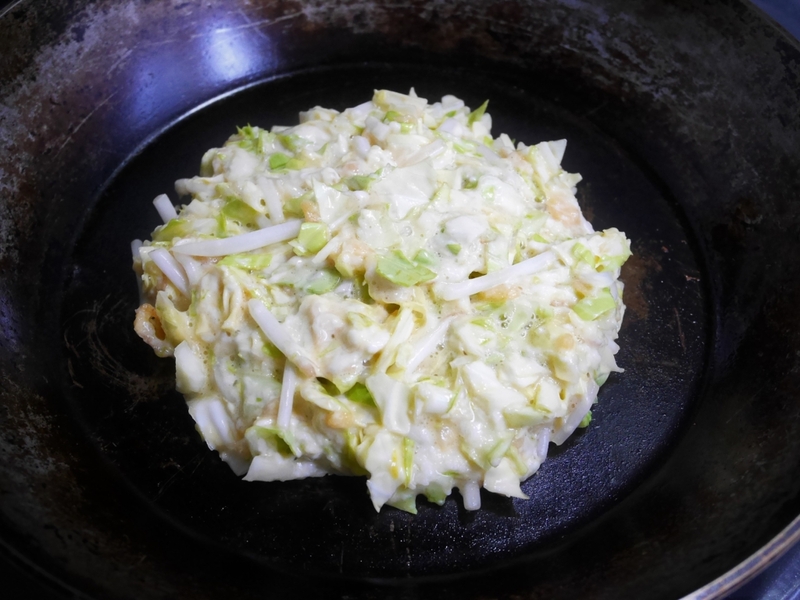 Pour the batter of Okonomi-yaki into the frypan. Put the sliced pork on the surface. Flip Okonomi-yaki when it gets a little charcoal. Flip it again when the sliced pork turns crispy. 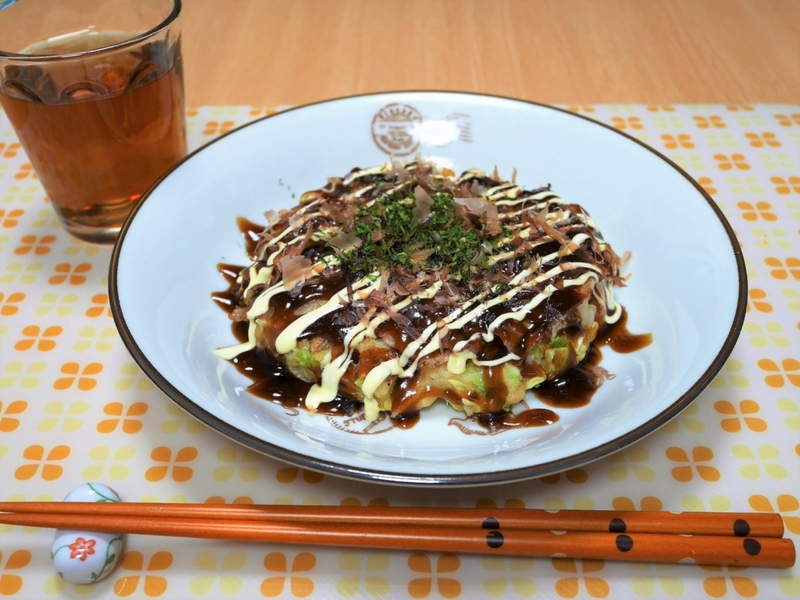 Serve Okonomi-yaki on the plate and put some sauce on it. 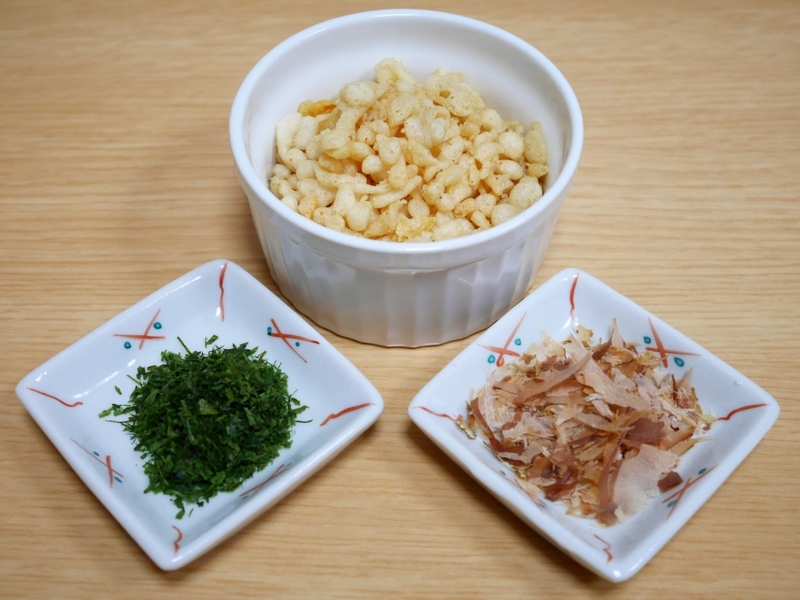 You can add some mayonnaise and sprinkle some bonito flakes and green nori to dress it up. 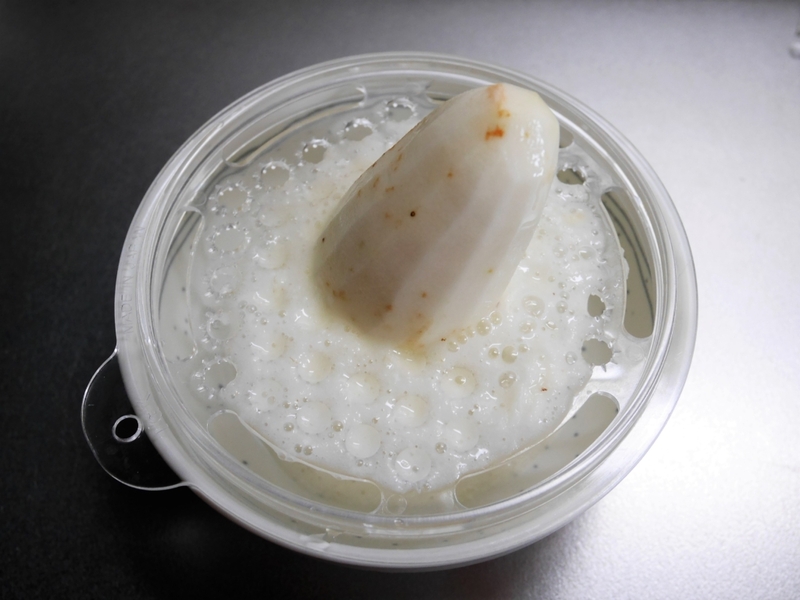 It’s better to mix the batter of Okonomi-yaki lightly again just before you grill it. Because it becomes watery as time goes on. You can keep them in the freezer if you cannot eat all. Wrap them with plastic wrap one each and put them in a freezer bag. (Get the air out of bag.) It’s best for about a month. When you want to eat, just heat with a microwave or a frying pan.